As is the case with many social services, client retention is one of the great challenges in the field of financial empowerment. We embarked on this project to address this challenge by asking questions about the importance of client retention: why does client retention matter? What factors affect retention? What elements of the service relate to client engagement and empowerment? Are there points within the service delivery to try out new approaches to improve client retention? We started the Discovery phase by assembling a multidisciplinary team of designers, financial counselors, industry partners and civil servants who could provide us with a diverse set of perspectives, skills and experience. Reviewing the practices of the hospitality and fitness industries to analyze the factors contributing to strong client retention. With our research findings, we co-created with subject matter experts at Neighborhood Trust Financial Partners (NTFP) a customer service journey map to understand the user's interaction with the service and its touchpoints. NTFP runs several NYC Financial Empowerment Centers in New York City. 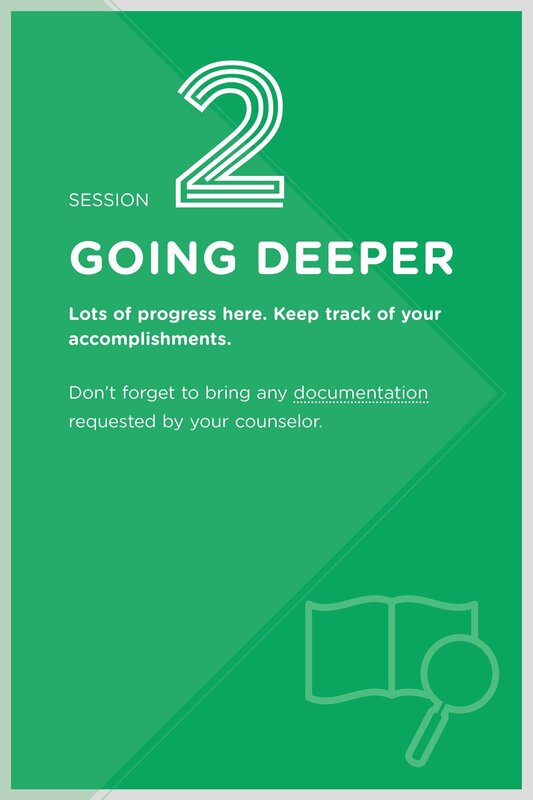 The journey map detailed the clients’ financial counseling experience, from scheduling an appointment to committing to and attending ongoing counseling sessions with their financial counselor. This report summarizes the Discovery phase and details our synthesis findings. Our work in the Discovery phase revealed opportunities as well as challenges within the financial empowerment ecosystem, which served as a foundation for the beginnings of our Co-Design work. We launched the Co-Design phase with a three-day design workshop facilitated by Parsons Transdisciplinary Design students. Drawing inspiration from our four Co-Design opportunity areas, the students brought together financial counselors and designers to reimagine the role and form of NYC Financial Empowerment Centers within local communities, and to sketch out new service interactions among local businesses, neighborhood ambassadors, schools, residents and counselors. The project team conducted Co-Design sessions with 58 financial counselors and managers from 16 different organizations in order to learn more about their motivations and challenges. Members of Neighborhood Trust Financial Partners, the NYC Department of Consumer Affairs Office of Financial Empowerment (OFE), Citi Community Development and the rest of the project team co-created a service blueprint for the envisioned financial empowerment user journey. Creating the service blueprint helped us visualize how users, providers and other stakeholders interact over time and brainstorm new ideas to create the desired service experience. Relevance: Does the idea address the identified problems, real or perceived? Does it influence client retention? Scalability: Can the idea be rolled out to NYC Financial Empowerment Centers situated in diverse neighborhoods, with varying scales of operations and client demographics? Generativeness: Will partners and community members be able to modify the idea based on their existing assets and needs to spur further creativity? Momentum: Can the prototype generate quick wins and garner support and future resources? As an outcome of our Co-Design and ideation sessions, we co-created a blueprint illustrating how the future financial empowerment journey could look. Service blueprints are typically grid like diagrams, with "front stage" user experiences and touchpoints depicted sequentially along the top row(s) and "backstage" provider/stakeholder actions aligned in parallel rows underneath. Each column represents a moment in the service, which can be examined, tested and improved upon. We created a large repository of ideas that emerged out of the co-design phase. We organized the ideas based on the areas of opportunity that they address. The full downloadable kit of ideas makes up a collection of actionable, interlinked service components for future discussion, further development, and adaptation in other contexts. This report links together our findings from the Discovery phase and the ideas generated in the Co-Design phase. It highlights the outputs generated while outlining our thought process throughout this phase. The goal of Prototyping is to take the ideas produced during Co-Design – ideas which were informed by the insights gathered during Discovery – and develop them into tangible artifacts and experiences that we can test and improve. When we began the Prototyping phase, the team ranked the Co-Design proposals according to their relevance, scalability, generativeness, and momentum. 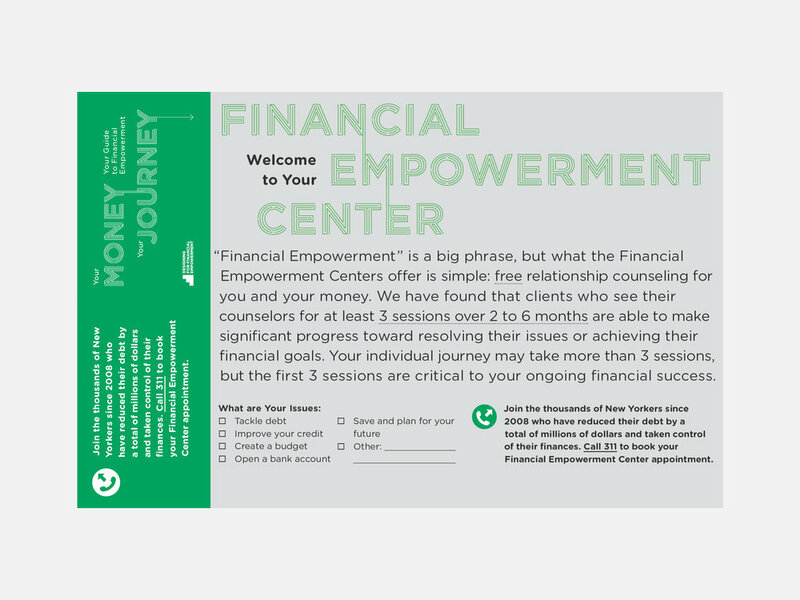 Four concepts emerged as strong options: an introductory video, journey map, 3-visit punch card, and an NYC Financial Empowerment Center “Live” event. Each intervention prototype maps to an insight from Discovery. Clients often did not know what to expect from the counseling service, so we sought to introduce them to the process and goals of counseling through an introductory video. 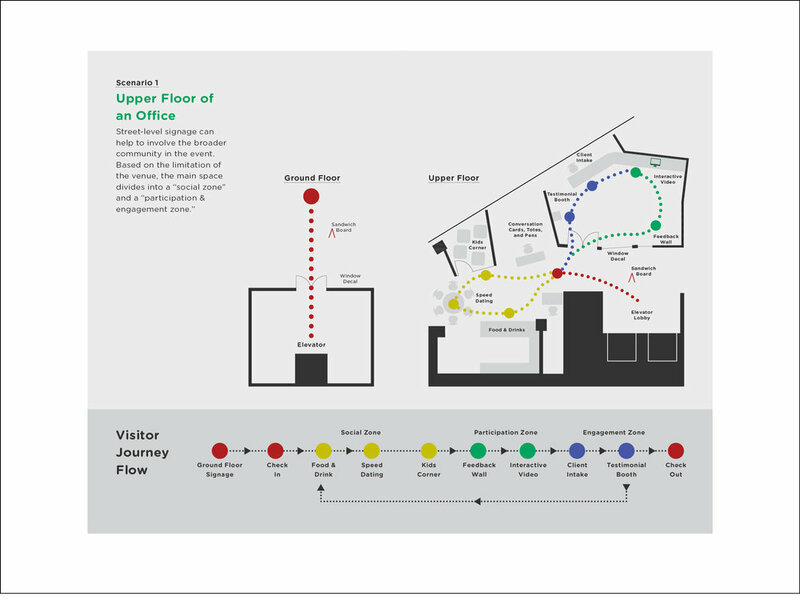 The journey map and 3-visit punchcard served similar wayfinding objectives, encouraging clients to view financial counseling more as an ongoing service relationship instead of as a one-off transaction. And the NYC Financial Empowerment Live event sought to experiment with a new channel through which clients can engage with counselors, other program staff and one another. A brief video that introduces the financial counseling service to new clients by describing the first session and the activities clients would do. It would showcase fellow clients describing their journey and experiences. This better prepares clients as they embark on their own journey and motivates them as they see examples of their peers achieving success. It also provides better support to counselors, as clients gain a clearer understanding and expectation of the counseling service. 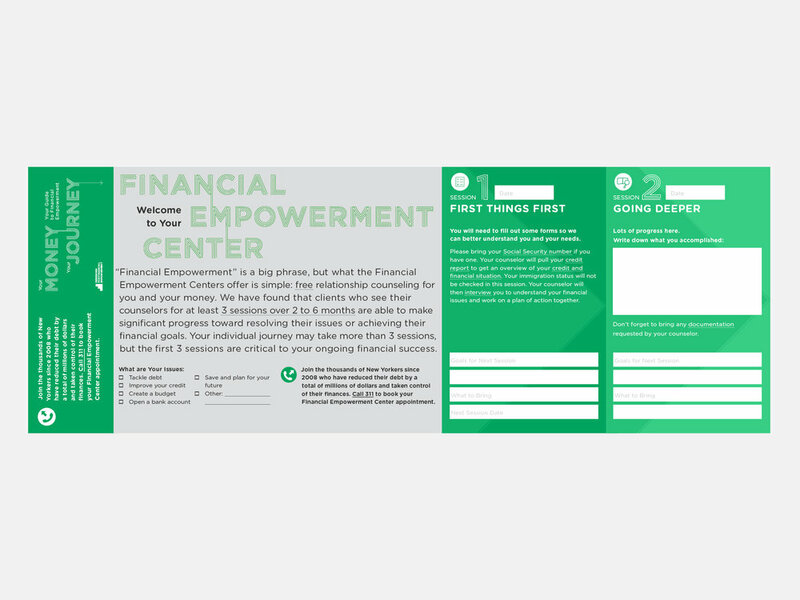 A visual wayfinding tool to help clients understand the steps of their financial empowerment journey. This provides greater clarity to boost clients’ ease and confidence in navigating the system and provides realistic milestones to empower them to track their progress and sustain their motivation. A physical “punch card” made in the size of a business card with blanks for three visits, to prompt follow-up visits and a sense of progress and achievement. This event is a prototype of a local community engagement strategy, allowing us to meet the public where they are, and create communities of shared interests. By bringing together former and current clients with counselors, we can activate local networks that build a sense of community ownership toward financial empowerment, thereby strengthening referral channels and client retention. This will increase the neighborhood’s understanding of the NYC Financial Empowerment Center as a neighborhood institution, and incentivize clients to step forward to share their stories and support one another in attending counseling sessions regularly, reaching their financial goals (such as savings goals), and achieving financial empowerment. 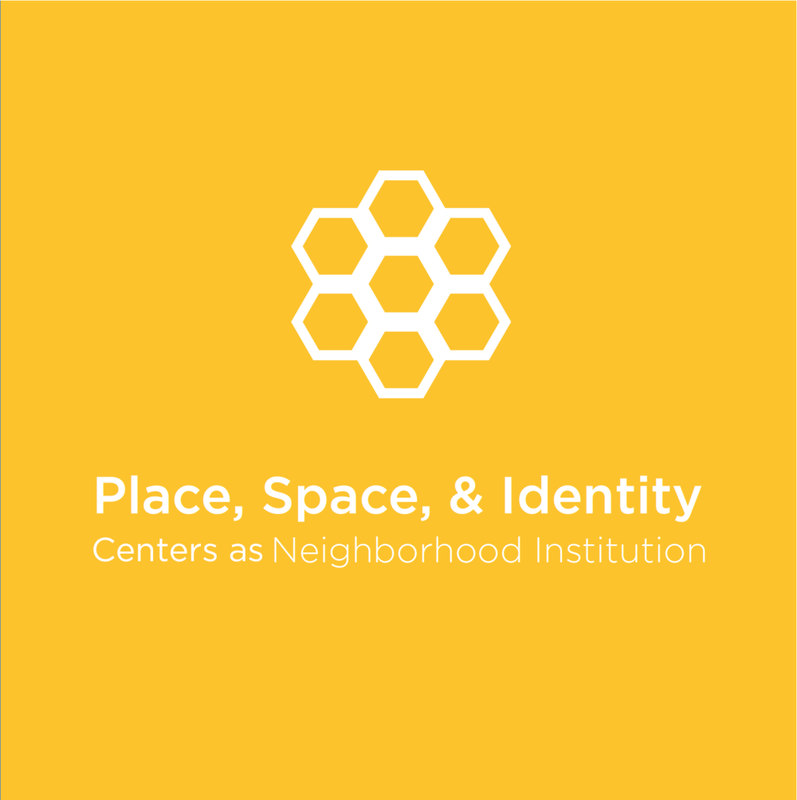 In the long run, such “pop-up” events can serve as a Discovery platform to learn about the needs of residents, and further ingrain the Financial Empowerment Centers and their services within the neighborhoods. For the introductory video, we experimented with the platform Adventr.tv to produce a “choose your own adventure”-style interactive video that followed the stories of two financial counseling clients: Stefano, a small business owner, and Elena, a grandmother taking care of her grandchild. The videos below feature Stefano talking about the counseling process and also show them in conversation with his counselor, Margarita. Click through to see both videos. The purpose of the video was to provide both procedural (what happens in counseling sessions) and emotional (how to deal with the difficult emotions related to money) wayfinding to potential clients. The prototypes that we created could serve as templates for future videos tailored to other client types and reasons for attending financial counseling. The videos could be placed on DCA and nonprofit providers’ websites, emailed or texted to new clients who book appointments, displayed on tablets and kiosks in waiting rooms, or even placed on LinkNYC units. As we further developed the journey map and 3-visit punch card concepts, we decided to combine these two ideas into a single concept, in the form of a credit card-size fold-out map that could fit in a client’s wallet. The integrated punch card and journey map would serve as a “membership card” and guide for new counseling clients. 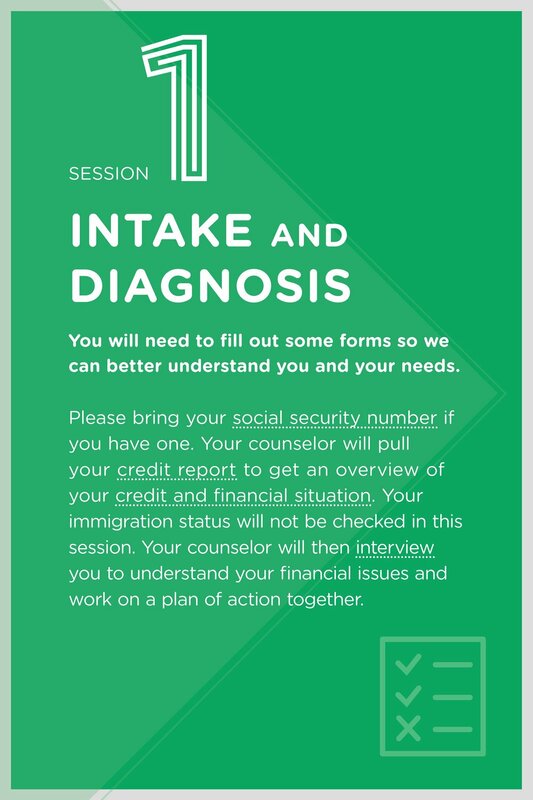 There is space on the map for clients and counselors to take notes about their work together over three counseling sessions. These prototypes were put into production and tested with clients and counselors in the beginning of 2017. These activities included a discussion area for clients and counselors to mingle, a children’s corner, and a table for booking follow-up sessions. We documented this event prototype with photography and video, and produced a “how to” guide aimed at financial counseling providers to help them adapt and produce their own events. The goals of these events would be to provide additional opportunities for neighborhood-level community outreach and to support existing word-of-mouth family and friend referrals. We have printed and distributed copies of the “how to” event guide and will work with a financial counseling provider to further test and prototype a public-facing event based on the guide. Finally, we produced a “Near Future” video portraying a possible future scenario of financial counseling in New York City. The video depicts the growing relationship between a client and counselor and brings to life our prototypes in the context of the client-counselor relationship and how these prototypes can deepen the relationship and further client retention. In addition to showing the Introductory Video, Journey Map, 3-Visit Punch Card and NYC Financial Empowerment Live Event, the Near Future video also makes reference to possible future design interventions, such as a private microsite and counselor toolkit. The microsite and toolkit would allow clients and their counselors to keep track and manage their budgets and financial progress over time. The Near Future video is meant as a way to document the prototypes and proposals made in the Prototyping phase and serves as a tool for furthering the conversation about the future of financial counseling. The introductory video to NYC Financial Empowerment Centers is a prototype. Its purpose is to reveal what happens in counseling sessions and to connect with potential clients by sharing how current clients are dealing with the difficult emotions related to money. This prototype is intended to serve as a template for future videos. 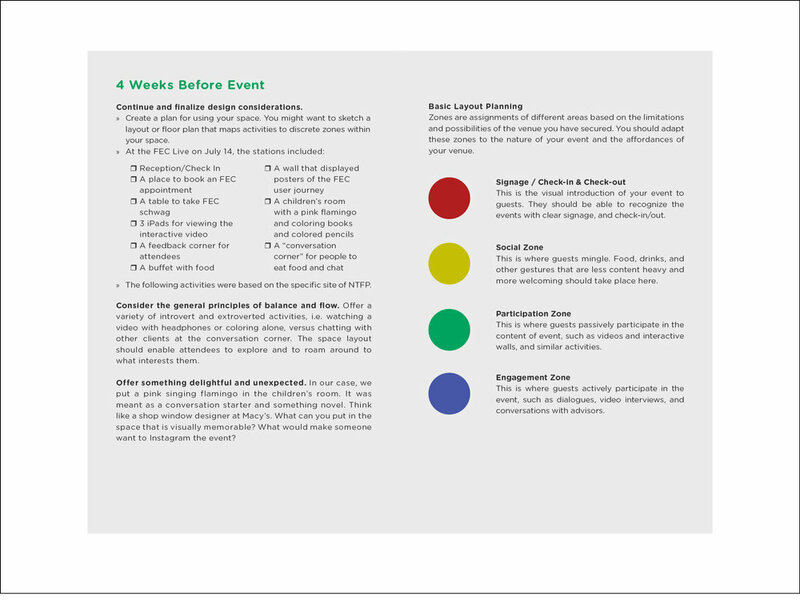 The Event Planning Guide and Journey Map are also prototypes intended to serve as templates for potential publications.